Project Modern: Challenge 4 Winners! Project Modern has been a huge success and we hope that you’ve enjoyed taking part in the challenges. We’re down to the end of things with the winners of Challenge 4! In this challenge of Project Modern, The Modern Quilt Guild challenged quilters to “find your own voice.” You can see all of the entries in this flickr group. (Just join the group to see all the photos.) Our judge for Challenge 4, Denyse Schmidt, loved a lot of the quilts that were entered and really struggled to pick three winners! She said “In general, I really loved how thoughtfully each quilter approached the challenge. I look forward to seeing more work from these talented and dedicated quilt makers. Thank you for the opportunity to see such great work!” Thanks so much to Denyse for the time she took to do the judging! Denyse said: This quilt is beautiful and striking in it’s clear simplicity and strong execution. The translation of the idea/inspiration into a quilted medium feels spot on, and every choice the quilter has made – from palette, to structure, and quilting – supports this clear vision and intention. I’d love to see the back! This quilt was inspired by a large metal silo at a farm that is about ten miles from my house. I’m sure I’ve seen that silo hundreds of times before, but one day a couple of months ago I saw something new in it as we drove by. Luckily my husband was at the wheel, so I grabbed my sketchbook and drew out a quick plan. There was just something about the linear repetition of the grooves of steel, and the grid that each tier of metal makes, that caught my eye. This quilt is my interpretation of it. For this project I used three solid colors of woven cotton: cream, pale blue, and a warm gray. I really liked how the colors worked together, and the combination reminded me of how the silo looks at dusk, when the entire structure seems to glow in the setting sun. 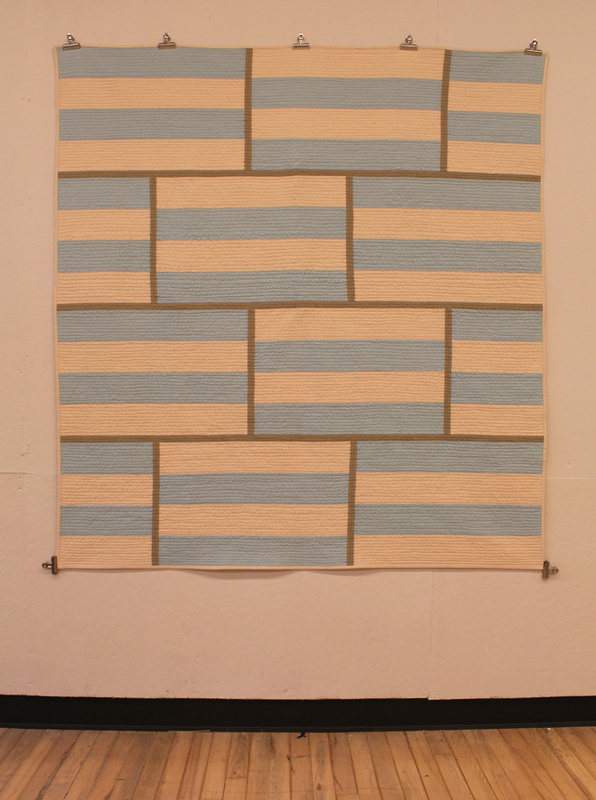 The large and small pieced rectangles are made up of bands of cream and blue, and the thin gray strips represent the grid work. I used cream for the binding so that it would not interfere with the design of the quilt top. I feel like this quilt is truly a reflection of my voice as a modern quilter. I’m often inspired by everyday places and things that most of us wouldn’t even notice, and I’m always excited by the challenge to translate that inspiration into my work. Denyse said: I have to admit I have never been a fan of the traditional Cathedral Window pattern, but this quilt proves how a well-executed idea and skillful use of color can transcend pre-conceived prejudices. The loose thread ends and random hand-stitching on the surface of a pattern that typically is fastidiously tidy first caught my eye. The beautiful use of color and “light” made it clear what this pattern was always intended to do. I love the combination/juxtaposition of a pattern that requires such diligence and skill, and the intention of exposing the process. The visual results are beautiful. This quilt IS and has always been, a challenge. It started as the Kona Solids challenge, and then when I finished it, and my husband LOVED it, (but not the size, at 55″ x 70″), I was challenged to double the size. I have always wanted to make a Cathedral Windows quilt, but being an athiest, I don’t spend much time in cathedrals… I tried to think of windows that inspire me, and I thought of all the amazing stained glass windows at my alma mater, Yale. My freshman year roommate was a Yale tour guide, so I soaked up much of the history of the school and it’s architecture… One of the coolest (or strangest) stories about the buildings at Yale, particularly the 7 original residential colleges, is that although they look centuries old, they were built in the 1930s, and artificially aged. I decided to make a faux vintage Yale windows quilt… oodles (37 yards of Kona Espresso worth. 487 total?) of folded brown squares (the wood of the window frames), colors cut up (and bits of espresso inserted, often in the shape of a Y), sewn both by machine (various colors of blue and green) and by hand (all the white). Some color groupings are missing squares (like the empty niches at Yale that were never actually filled), while others have a substitute. I wanted to make sure people could tell the “aging” was intentional, so I pulled all the threads to the right side, so the back is clean and neat. I’m not sure what the biggest challenge was: working with the weight; all the hand-sewing; all the folding and ironing of all those little squares; or just the sheer size (110″ x 70″); but I love love love love love this quilt (which is like a bed scarf on my bed, and I love it every day). It has been washed multiple times, and each time I make sure all the threads are still on the right side. Denyse said: There are a lot of things I love about this quilt. I love the quilting pattern (feels like a moving blanket), especially in red on grey. I love how the quilter contained his/her beautiful, chaotic experiments in the expanses of neutral grey. It produces a quilt with rich detail, yet an overall feeling of spareness – and I love that juxtaposition. I like also how the quilter has found a way to answer their likes and dislikes, and solve problems. And I like Neutral Milk Hotel! Reason: Every quilt that I have ever made was for someone else. This quilt is for me. Design: I like lines and empty spaces, but I also enjoy experimenting. In addition I love quilts that are completely two sided. Inspiration: She broke up with me. Style: I like making 10 inch blocks that are mini pieces of art. I also get bored of making the same block over. Function: I’m terrible at making my bed and I need a quilt that will easily look good. Detail: Some of the same fabrics lines are used on both sides just in different color shades. The winner of the drawing prize package is Megan Norrell! Also a huge thank you to all of the generous Challenge 4 sponsors, Free Spirit Fabric, Stash Books, Robert Kaufman, Aurifil, Spoonflower and Janome America. AND FINALLY – it’s time to get to the winner of the Janome Horizon! The winner is… Heather Freeman of Columbus, OH. A huge congrats to you! This is seriously your lucky day! Congrats to all of the winners and thanks to each and every one of the entrants of all four of the challenges of Project Modern! 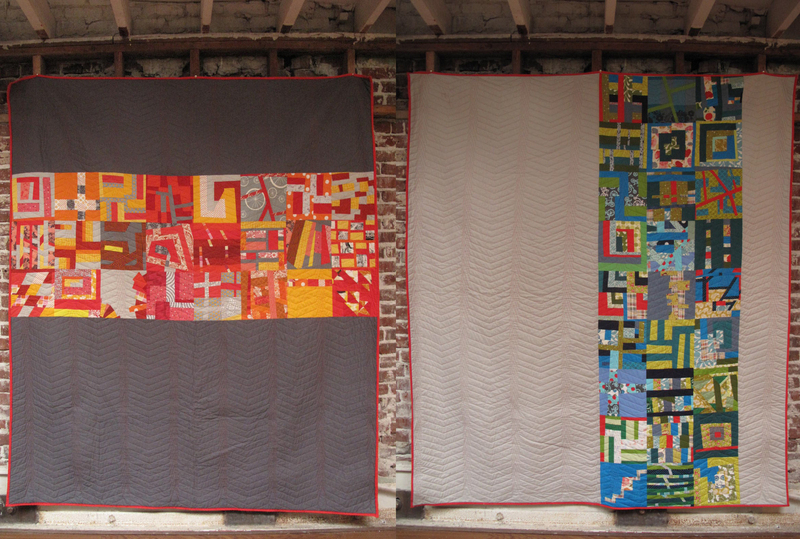 You made it such a hugely successful year of making modern quilts! Project Modern Challenge 4 – down to the wire! Just a quick post to remind you all that the deadline for Challenge 4 is just ten days away!! If you aren’t sewing yet it’s time to get started! All of the challenge details are here. 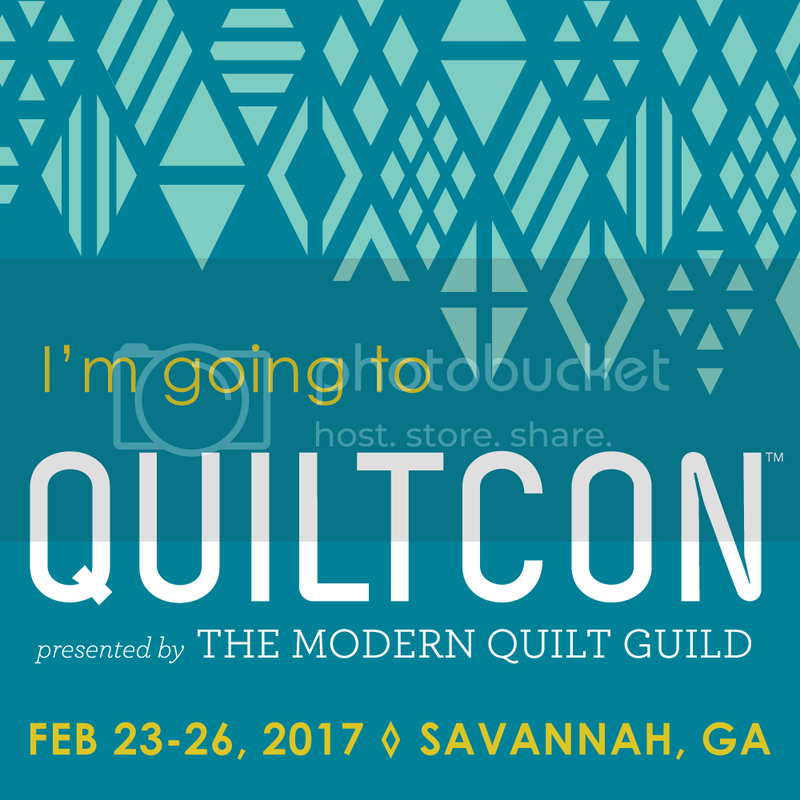 We can’t wait to see all of the amazing modern quilts you make! Project Modern: Challenge 3 Winners! In Challenge 3 of Project Modern, The Modern Quilt Guild challenged the quilting community to design a quilt inspired by the word “organic.” You can see all of the entries in this flickr group. (Just join the group to see all the photos.) Our judge for Challenge 3, Pokey Bolton, loved a lot of the quilts that were entered but in the end there had to be three winners picked! Thanks to Pokey for time she took to do the judging! Pokey said: This quilt is the perfect example of how sometimes when you don’t begin with a Grand Plan for a quilt, you can still create a gorgeous quilt. I can tell this quilter had a lot of fun during the creation of this quilt, making color and pattern decisions as she went. 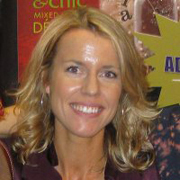 Alison’s description: One of the definitions of the word ‘organic’ is ‘developing naturally’. I started this quilt with one basic idea: quilting is about cutting fabric into little pieces and sewing them back together again. I was inspired by a quilt created by Joelle Hoverson in her book Last-Minute Patchwork + Quilted Gifts called the Little Bits Quilt. I had no other ideas where I was going to go. I started with several strips of little bits and pieced the rest of the quilt completely improvisationally. 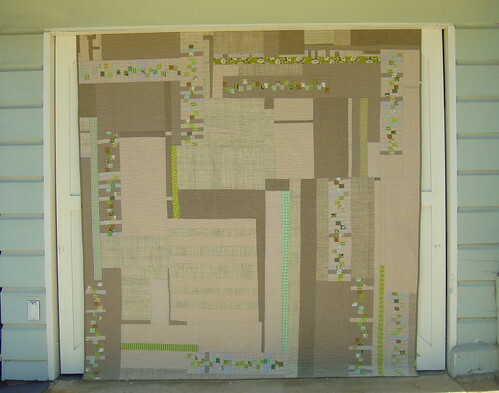 I laid out my first pieces on a design wall, and stared and thought, and added in some long strips of green, trying to balance out the colors and move your eye around the canvas….quilt. I kept finding myself using the word ‘organic’ when I was trying to explain how I wanted the quilting to look. I tried to mimic the ripples that wind makes on a body of water with my stitching, and I think it looks just right for the quilt, a natural choice. I believe my entire process making this quilt was organic, doing what I enjoy and what just felt right at the time. Pokey said: I love this quilt and relate to the yearning for blooming forsythia in early spring after a hard, snowy winter! I also thought this quilt brings a fresh aesthetic to the modern quilt movement. First, while my fabrics aren’t organic, they are used sheets and reclaimed vintage fabrics, and thus earth friendly. 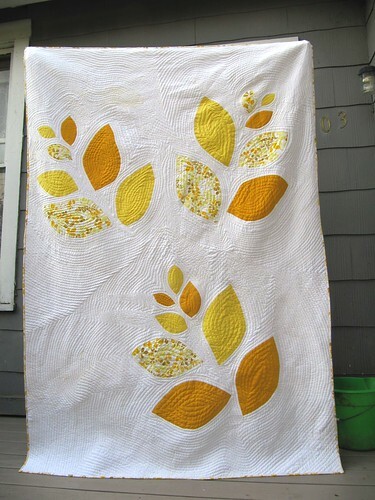 I planned out this quilt in early spring, when I was so hungry for those first yellow leaves of forsythia. We had a snow in April, so the idea of yellow leaves on a field of white is not too far-fetched. I machine-quilted echo after echo around the fuse-applique raw-edged leaves and was pleased to see the ripples spread out like the rings around a raindrop in a puddle. Overall, this quilt has so many of my favorite spring features in it! It also has 4 spools of yellow thread! Pokey said: This is a very striking and graphic quilt that to me is very original. I love the inspiration of petrified wood. I can see it! After reading the challenge, I sat down with a piece of blank paper and started sketching organic shapes. This quilt evolved from one of the sketches. The shapes and colors remind me of petrified wood in the desert. Did you enter to win the Janome Horizon? We will be picking the winner at the end of the contest period in September, 2011 (you’ll have one final chance to enter over the course of Challenge 4). To coincide with each of the Project Modern Challenges we are picking a winner of a smaller prize pack. Of course we used the random number generator and number 284 won! Congrats, Marge Paton of Riverview, MI You will receive a copy of the Quilting Arts DVDs and fabric bundles from Daisy Janie and Cloud 9 Fabrics. Congrats to all of the winners and thanks to all the entrants! Also a huge thank you to all of the generous Challenge 3 sponsors, Daisy Janie, Cloud 9 Fabrics, Quilting Arts and Janome America. Lastly, please check back here on July 18th to enter to win the Janome Horizon and we hope that you are all working away at Challenge 4! Make a quilt that is all you! Like all of the other challenges, use of other designers’ patterns is not allowed but this time, find your own voice. Spins on existing techniques, improvisation, fabric manipulation – any and all of it is allowed and encouraged. Stretch and push yourself to make something that you’ve never made before! Why not skip using a ruler? Why not be open to changing your initial plans and ideas along the way? Innovate! Make this quilt your voice and yours alone! Denyse Schmidt has been designing and making quilts since 1996 when she established Denyse Schmidt Quilts. A former graphic designer and graduate of Rhode Island School of Design, she has generated international attention for her modern spin on classic quilts. 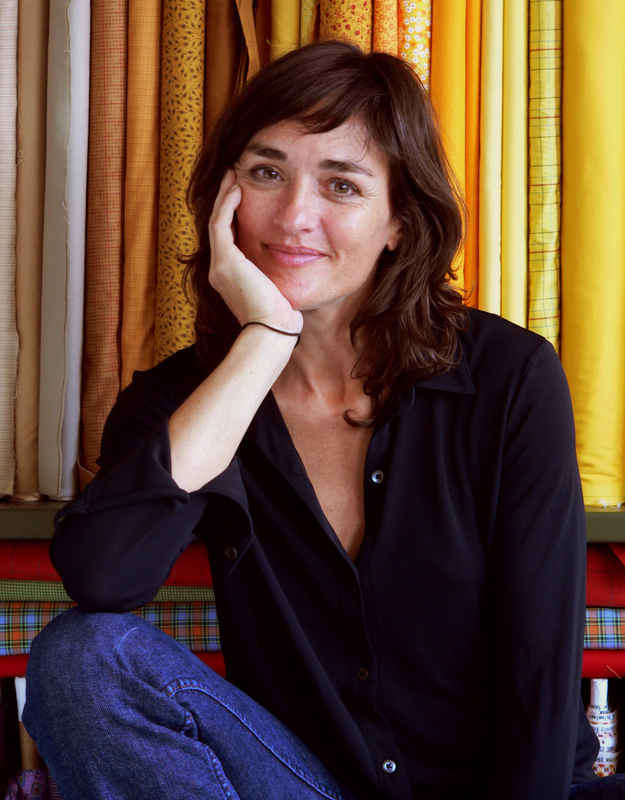 Her studio, in Bridgeport, Connecticut, produces three quilt collections, available from retailers nationwide. Denyse’s quilts have been featured in numerous publications including the New York Times, Martha Stewart Living, People, O, the Oprah Magazine and Time. She has designed and released multiple fabric lines and her first book, “Denyse Schmidt Quilts” came out in 2005. Her second book comes out in Spring 2012. You can visit Denyse Schmidt at http://www.dsquilts.com. 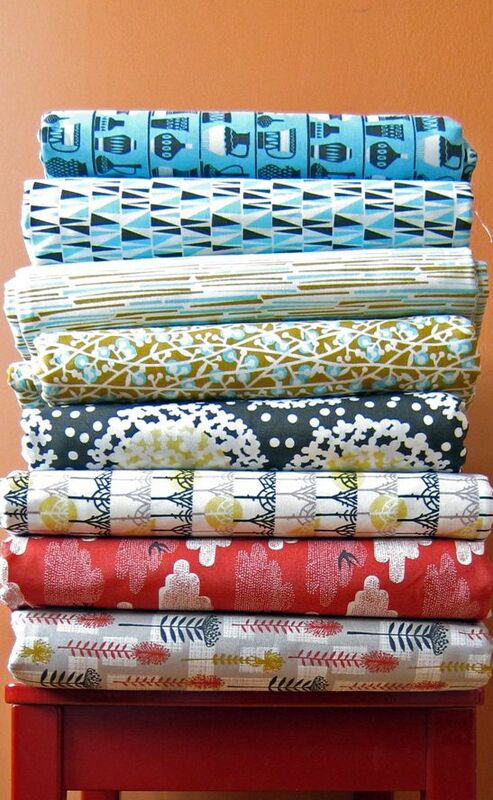 A one yard bundle of Denyse’s fabric line, Greenfield Hill from Westminster/Free Spirit Fabrics. 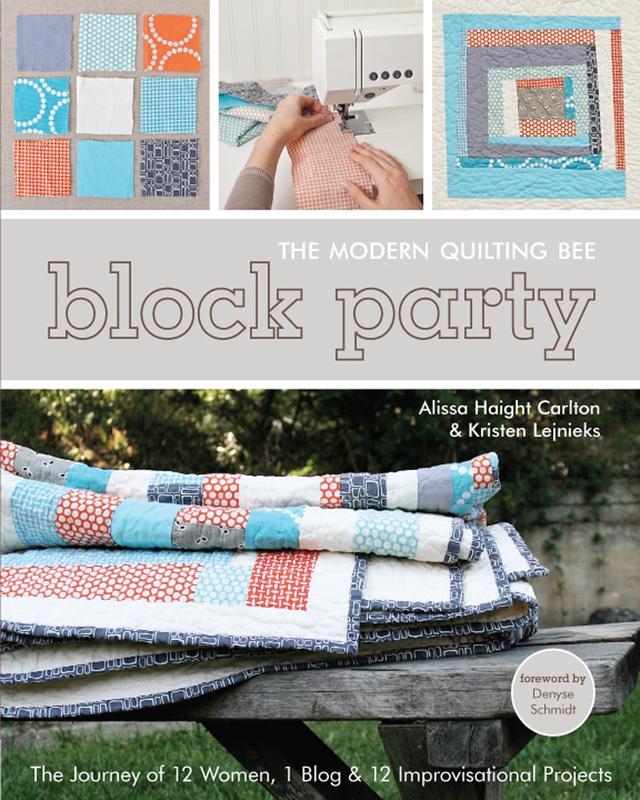 A copy of Block Party: The Modern Quilting Bee from Stash Books. By Alissa Haight Carlton and Kristen Lejnieks, Foreward by Denyse Schmidt! From Robert Kaufman, a large bundle of neutrals! Having so many neutrals enhances a stash so much. Also included in the prize package is a a thread prize from Aurifil! And from Spoonflower, a $50.00 gift certificate. You can create and upload your own textile designs and have it printed on demand on seven different fabric weights. Or you can order original designs by other independent fabric designers. Finally, that Janome Horizon sweepstakes is still going strong and we’ll be drawing a winner in a few short months! Everyone should check back here on July 18th for more information to enter. Be sure to enter for your forth and final chance at winning the Janome Horizon Memory Craft 7700QCP sewing machine drawing, courtesy of Janome America. You’ll also automatically be entered to win a copy of Block Party, the gift certificate from Spoonflower and a Greenfield Hill one yard bundle from Free Spirit! A huge thank you to our generous contest sponsors! 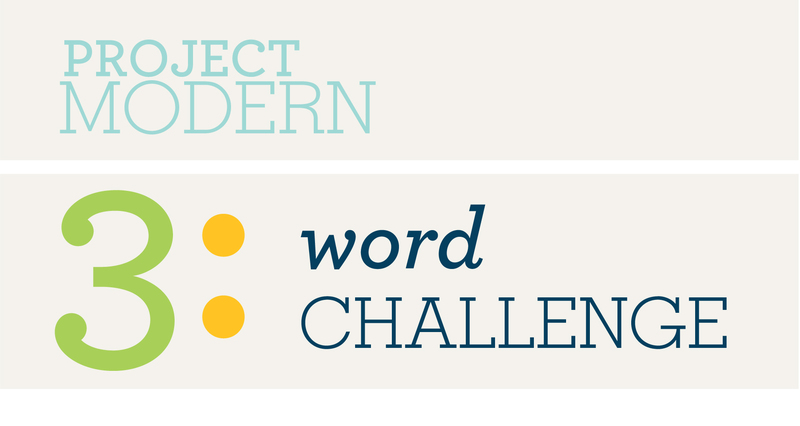 – To enter your submission for Challenge 4 please email the following to projectmoderncontest@gmail.com. – All entries for Challenge 4 must be received by September 30, 2011. – The winners of Challenge 4 will be announced on or about October 15, 2011. – US residents only are eligible for the prizes. – The three winners of Challenge 4 will be selected by our Guest Judge, Denyse Schmidt. At the judge’s discretion, members of The MQG Planning Committee may aid in selecting finalists. However, no person involved in the judging process will know the identity of contest entrants. Each winner will receive an identical prize package. – Project Modern will be conducted on and through The MQG’s website. The details of each challenge, and the winners will be announced on the blog. – All Challenge 4 submissions will be posted in a public Flickr group after October 15th, 2011. – Full challenge rules here. The deadline has passed for Challenge 3 so thanks to all of you who submitted a quilt! The winners will be announced by July 15th. Meanwhile, we aren’t going to keep you waiting for Challenge 4! It will be revealed on Tuesday, July 5th so keep an eye out here and get ready to quilt, quilt, quilt! Project Modern Challenge 3 – down the the wire! 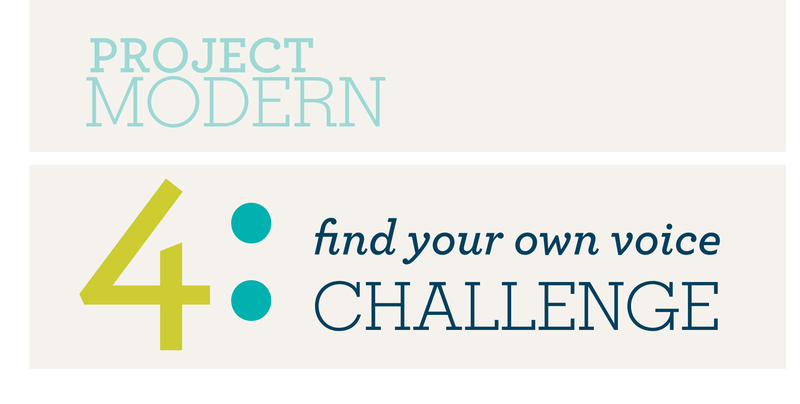 Hope you’re all quilting away as the deadline for Project Modern Challenge 3 is just days away! You have until midnight (pacific time!) on June 30th to get your submissions in! We can’t wait to see all of your “organic” quilts! Your third chance to win the Janome Horizon! Here it is – another opportunity to win the Janome Horizon Memory Craft 7700QCP sewing machine! Just complete this form and you’ll be entered! The winner of the Janome Horizon Memory Craft 7700QCP will be chosen within seven days of the close of the contest on September 30, 2011. This is the third of four chances to win. The four entry periods correspond with the four Project Modern challenges. During this second entry period, which will be open until June 30, 2011, entering to win the Janome Horizon will also automatically enter you to win a copy of the Quilting Arts magazine & DVD’s, plus fabric bundles from both Daisy Janie and Cloud 9 Fabrics! So fill out the entry form and you’ll be entered to win both the sewing machine and the other prizes!! The winner for the prize drawing will be announced when we announce the winner of Challenge 3. Complete sweepstakes rules can be found here. Project Modern: Challege 2 Winners! 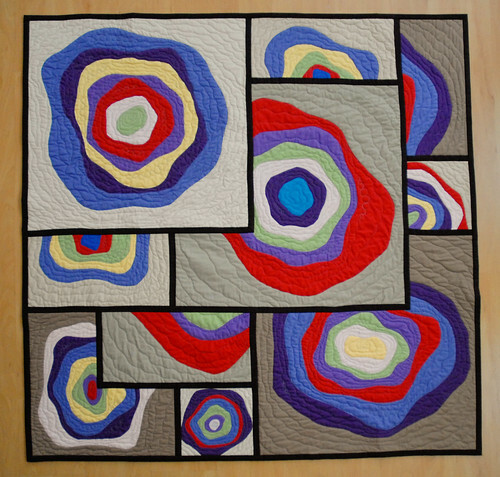 In Challenge 2 of Project Modern, the Modern Quilt Guild challenged the quilting community to design a monochromatic quilt. We were so thrilled to get 71 entries! You can see them all in this flickr group. (Just join the group to see all the photos.) Our judge for Challenge 2, Malka Dubrawsky was so impressed with the overall quality of all of the entries! Thanks Malka for time and effort that you put into judging for us! Ok – on to the business at hand! And the winners are (in no particular order)! Malka says: Wow! I think you really did a lot with a limited color palette. Your monochromatic quilt has so much color subtlety and all those bits of color enhance the energy of the star-like shape. It’s amazingly graphic and that’s hard to do without a lot of contrasting colors. Really, quite impressive. Congratulations! 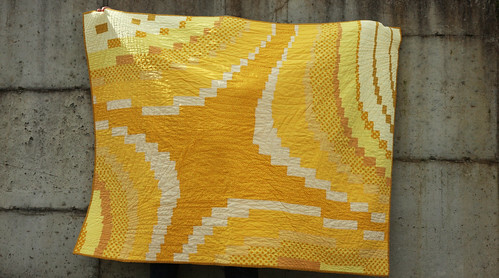 This quilt is called “Yellow Quilt”. I was inspired by a very bold, graphic photograph I came across of a tile pattern on the side of a building. I had been wanting to make a quilt for our brown and yellow family room, so I decided to take this image and translate it into a yellow quilt. This is a color that I have not worked with much and I wanted to really challenge myself. My process started with pulling the original photo into a CAD program and drafting a pattern for the quilt over the photo. I then took the drawing and ‘colored’ it with several different schemes in Illustrator until I came up with one I liked. With my color scheme in hand I ordered 10 different kona solids from the yellow palette. I didn’t end up using all of the solids, I really wanted to add some prints for a bit more of the fun, modern feeling that I was going for. It was really hard to find fabrics that gave me the feeling I wanted and were truly monochromatic. The solids range from the palest wheat-yellow to a deep ochre, and the prints are all yellow on yellow and simple dots. It was really fun and challenging to make a quilt with a limited palette like this, and it has given me a lot of confidence that I can step out of my comfort zone and come up with an end result that I am really proud of. Malka says: There are so many things I love about this quilt. First off, being a fan of Albers myself, I totally see the reference and I think it’s beautifully done. Also, the simplicity of this quilt and the scale of the blocks really work together. I think the pinks take it past it’s Bauhaus reference to pop art. It references so much, but is also just plain pretty as well. Great job! 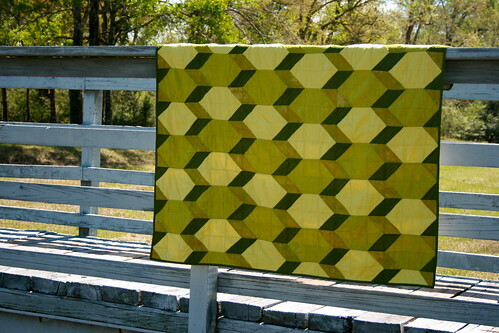 The Anni quilt is my entry for the Modern Quilt Guild’s Project Modern: Challenge 2–Monochromatic. 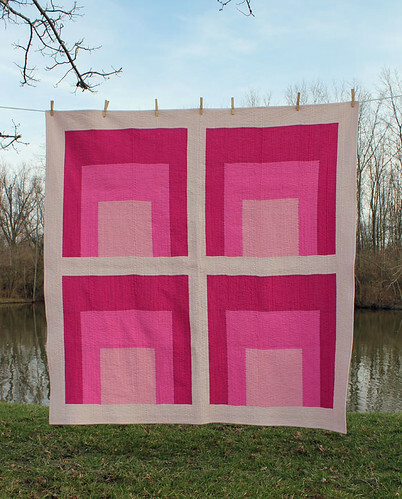 It’s made out of four shades of pink solid cotton, and the design was inspired by the Modernist painter Josef Albers’ series of works titled Homage to the Square. His wife Anni was a fibers artist who worked as a weaver and also designed textiles. Anni believed that fabrics should be considered as an art form in and of themselves, in both their functional use day to day, but also in their use as hanging works of art. So, I felt it was fitting to name my quilt after her. I sketched out this quilt design a few months ago, after browsing through some works by Albers. I thought his square paintings would relate nicely to quilt blocks. In my design I decided to shift the layout of the squares. I placed the smallest square directly on the base of the larger square, instead of having the square float inside the larger one, as they frequently do in Albers’ paintings. While I was planning the project, I was immediately drawn to using pink fabrics for the quilt. After a long, cold winter, I thought a nice pop of pink would would do me some good. 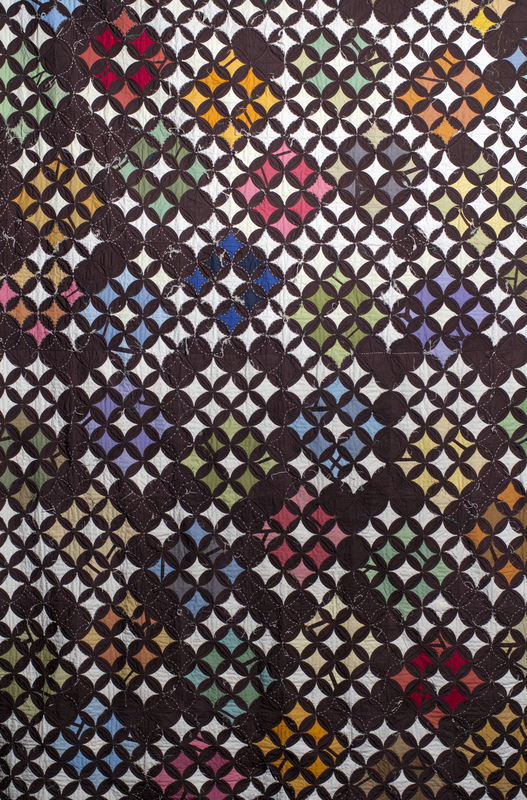 The quilt measures 62” x 62”, and each of its four large blocks measures just over 24” square. I used four shades of pink cotton: the center of the smallest square is Robert Kaufman’s Kona Medium Pink, the middle sized square is Moda’s Bella Peony, the largest square is Bella Magenta, and the sashing and binding is Kona Pale Flesh. The backing is Bella Peony with one small pieced square, repeating the design on the front of the quilt.I really think the large scale of the blocks, with the shift in color from lighter to darker pink, gives this quilt a lot of movement. The framing of the blocks with the palest pink provides visual emphasis to each pieced square, but also ties everything together in the form of yet another square. I love the look of heavy quilting and all the texture that it adds to a quilt. I decided to use 1/4” straight line quilting with light pink thread for this project because I think it really compliments the square motifs of the design. Malka says: Oh man, I totally love this quilt. it goes beyond being a quilt and becomes a textile. By that I mean it celebrates pattern and design. Amazingly, it seems to do that with the simplest of shapes, squares and triangles. It’s all about how you manipulated the values. It’s a quilt of illusion and I’m a big fan. Congratulations on a beautiful quilt! Mary’s Description:This quilt is a 54″x54″ quilt I am calling Shadowboxer. It is made using 2 Moda crossweaves as the hex shapes and a moda grunge + solid as the two shadow colors. This was inspired by a 1970’s purse I saw while thrifting. I thought it would translate well into a monochrome quilt and when I saw the challenge posted that very week I knew I had to try. I chose green because it is my favorite color. A friend remarked that the quilt looks like a Turtle Shell which is so true. I figured out a simpler construction method toward the end and it was so much easier I know I want to make another quilt like this perhaps in a neutral color scheme of warm whites. I quilted the top/bottom of each hex in the ditch and then did straight line quilting 1/4″ apart in the shadow sections that followed the angles of the shadow. I used a green variegated Affinity thread. Did you enter to win the Janome Horizon? We will be picking the winner at the end of the contest period in September, 2011 (you’ll have two more chances to enter over the coming months). To coincide with each of the Project Modern Challenges we are picking a winner of a smaller prize pack. Of course we used the random number generator and out of 1409 entries, number 640 won! 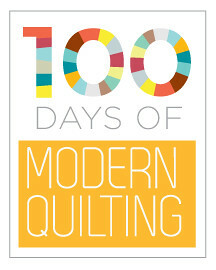 Congrats, Teresa Eliason of Chesapeake, VA. You will receive a copy of Malka’s book, Fresh Quilting. Also a huge thank you to all of the generous Challenge 2 sponsors, Interweave, Robert Kaufman and Janome America. Lastly, please check back here on April 18th to enter to win the Janome Horizon and we hope that you are all working away at Challenge 3! Ok Modern Quilters! Are you all ready to take on Challenge 3? Here we go! Make a quilt that is inspired by one word. This word will be your only guidance. What does it mean to you? What emotion, image or thoughts does it invoke? Let’s see that in your quilt! Pokey Bolton was introduced to art quilting and the related fiber arts in 1998, and ever since she took her first stitch (a fly) and embroidered her first motif (a spider), she has been entangled in this art form and doesn’t envision herself free. Art quilting and mixed-media have, quite literally, taken over her life–so much so that she left her doctoral program and full-time teaching job to found Quilting Arts Magazine®, and later with her husband John, Cloth Paper Scissors® magazine. Both magazines were acquired by Interweave Press in 2007 and Pokey is now the editorial director of their Quilt and Paper Division. She is also the author of “The Quilting Arts Book: Techniques and Inspiration for Creating One-of-a-Kind Quilts” and “1,000 Artist Trading Cards: Innovative and Inspired Mixed Media ATCs.”Pokey and John (now Vice-President at Interweave) have a menagerie of animals, some of whom make an appearance now and then at Quilting Arts headquarters. Pokey is also the host of Quilting Arts TV on PBS, and when she isn’t at the office or a taping, she can be found in her studio at home–her absolute favorite place to be! 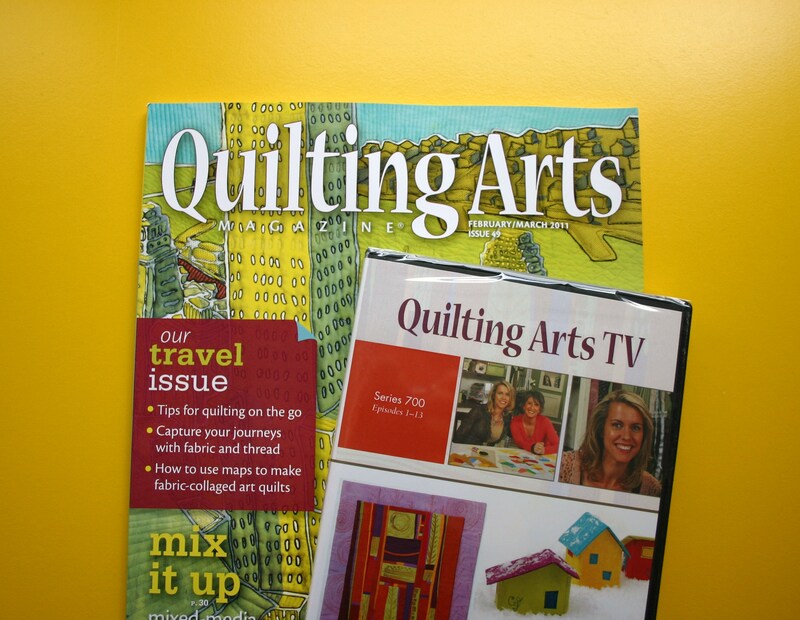 A copy of Quilting Arts Magazine and a set of Quilting Arts TV DVDs. 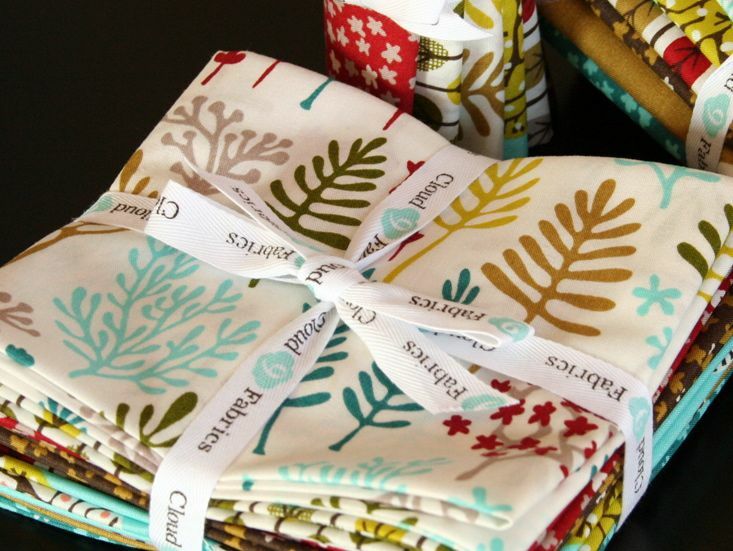 And, in keeping with the word inspiring your quilts, you will win some truly beautiful organic fabrics! 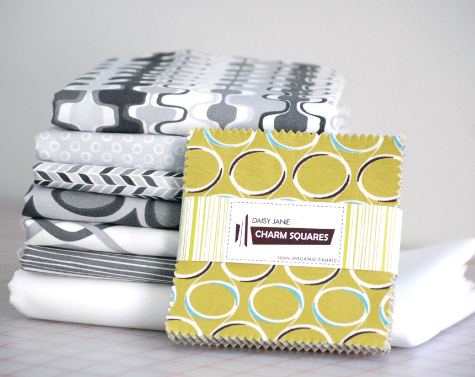 First, from Daisy Janie you’ll get a yard set of the entire wonderful new line Shades of Grey, a charm pack of Geo Grand, and 2 yards of 54″ white sateen! …and a fat quarter bundle of Nature Walk! Finally, that Janome Horizon sweepstakes is still going strong! 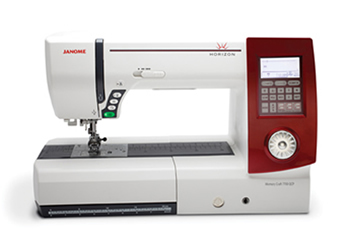 Everyone should check back here on April 18th to enter for your third chance at winning the Janome Horizon Memory Craft 7700QCP sewing machine drawing, courtesy of Janome America. You’ll also automatically be entered to win a copy of the Quilting Arts magazine & DVD’s, plus fabric bundles from both Daisy Janie and Cloud 9 Fabrics! 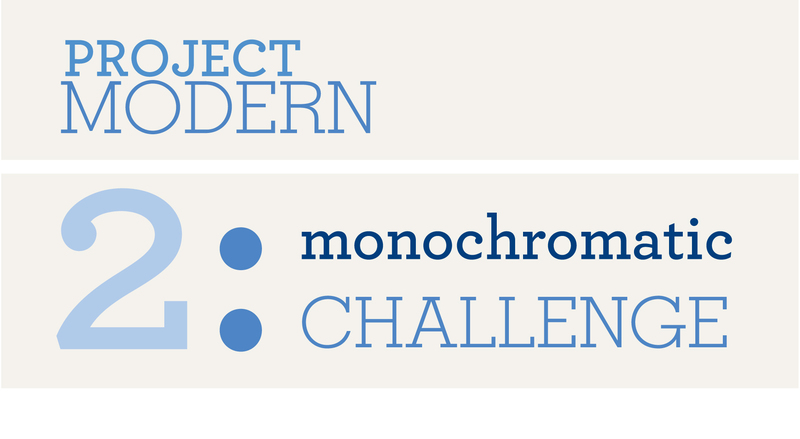 – To enter your submission for Challenge 3 please email the following to projectmoderncontest@gmail.com. – All entries for Challenge 3 must be received by June 30, 2011. – The winners of Challenge 3 will be announced on or about July 15, 2011. – The three winners of Challenge 3 will be selected by our Guest Judge, Pokey Bolton. At the judge’s discretion, members of The MQG Planning Committee may aid in selecting finalists. However, no person involved in the judging process will know the identity of contest entrants. Each winner will receive an identical prize package. – All Challenge 3 submissions will be posted in a public Flickr group after July 15th, 2011. The deadline has passed for Challenge 2 so thanks to all of you who submitted a quilt! We sent out a reply email to each entry – so if you didn’t get an email from us please let us know by contacting us at projectmoderncontest @ gmail.com. Malka Dubrawsky, our judge for this challenge is sorting through the submissions and the winners will be announced by April 15th. Meanwhile, we aren’t going to keep you waiting for Challenge 3! It will be revealed on Monday, April 4th so keep an eye out here and get those sewing machines ready…!